History: Although The Doctor has more regularly battled the Rutans’ enemies, the Sontarans, the Rutans themselves have regularly disproved the idea that ‘the enemy of my enemy is my friend’, often posing just as great a danger to The Doctor as the Sontarans, even if he has managed to work with them on occasion. When The Doctor first encountered a Rutan, the Fourth Doctor and his companion Leela had landed on a lighthouse off the coast of England in the early 20th century when The Doctor made a mistake setting the coordinates while trying to go to Brighton ("Horror of Fang Rock"), quickly discovering that one of the lighthouse keepers had been murdered, that a strange light had fallen from the sky, and that the electricity flow to the lamp had become erratic. Quickly deducing that something was responsible for draining the power from the lighthouse - although not in time to stop a luxury yacht crashing into the rocks, even if the passengers were rescued -, The Doctor realised that the dead lighthouse keeper had been used to provide an ‘anatomy lesson’ for the invader, but he still failed to realise that the lighthouse had been infiltrated when one of the keepers was replaced until most of the yacht crew were dead. Confronting the alien, The Doctor confirmed its identity as a Rutan trying to summon the mother ship after its scout ship crashed, subsequently destroying the Rutan with a makeshift mortar bomb before using diamonds acquired from the yacht passengers to turn the lighthouse into a high-intensity laser that destroyed the Rutan mothership. 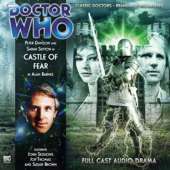 The Fifth Doctor had another interesting encounter with Rutans when he and his companion Nyssa discovered Rutans hiding in a castle near the village of Stockbridge ("Castle of Fear"), a location that he had become fond of over his various visits. Having become trapped there while tracking Linx - a Sontaran warrior who had already been defeated by the Third Doctor and his allies ("The Time Warrior") -, the Rutans sought to create a clone factory in the village, creating clones of Rutans while in human form, with Stockbridge’s residents possessing elements of Rutan genetics when one of the clones escaped and mingled with the local human population, their factory finally ceasing ‘production’ when the water mill that powered it was destroyed, removing the static electricity that the Rutan drones relied on. The Rutans briefly captured Nyssa, but she was able to trick them into letting her go by providing them with a device from the TARDIS that could generate unlimited power, Nyssa revealing to The Doctor after the Rutan ship took off that the device had been pre-programmed to generate an ever-increasing amount of power until it finally exploded. During a visit to the human colony world of Raghi - located in an area of space that had once been populated by The Tzun - the Fifth Doctor and Turlough ("Lords of the Storm") discovered a strange new disease that was sweeping the colony as well as several missing scientists. Discovering that the Sontarans had taken control of Raghi’s sister colony Agni and were kidnapping the scientists, The Doctor soon discovered that Raghi’s entire population were being used as bait for a Rutan trap. The strange disease The Doctor was investigating caused all humans infected with it to register as Sontarans on the Rutan scanners, driving the Rutans to avoid that area of space, and thus giving the Sontarans unrestricted access to Tzun technology. Contacting the Rutans, The Doctor managed to make a deal with them, exchanging the truth about the colony - while avoiding to mention the Tzun technology - for their promise not to harm the humans, provoking a conflict between the two enemies that ended when one of The Doctor’s allies sacrificed themselves to stop an unstable ship from destroying the colony. Returning to the TARDIS, The Doctor and Turlough escaped, unaware that a disguised Rutan agent had escaped after learning that the Sontarans had uncovered some vital information about the Rutans. The Sixth Doctor faced the Rutans when investigating a mysterious signal being transmitted from Earth in 1872 ("The First Sontarans"), discovering a Rutan infiltration unit - far more skilled at disguise than other Rutans The Doctor had encountered - that was attempting to acquire a series of weapons designed specifically to destroy Sontarans that had been created by the Kaveetch, the Sontarans’ original creators; they had cloned the Sontarans as warriors against a Rutan invasion, only to be all but destroyed when the Sontarans subsequently turned against them. However, despite the presence of a cloaked Rutan fleet, their efforts failed, with the Sontarans destroying the few Kaveetch survivors. Although the Rutans attempted to track the Sontarans back to their homeworld, Peri and Leandra - one of the only Kaveetch survivors, the other being her husband Roath - were able to provoke the Rutans into attacking the Sontaran ship too soon, the Rutans and the Sontarans destroying each other while The Doctor, Peri, Roath and Leandra retreated to the TARDIS. Two incarnations after the confrontation on Raghi, the Seventh Doctor, now accompanied by Bernice Summerfield, Chris Cwej and Roslyn Forrester, set out to track down the Rutan agent and learn what had been discovered in the Sontaran data banks. Despite the agent's attempt to escape, The Doctor eventually learned that the Sontarans had learned of the existence of a natural wormhole between the Rutan homeworld and the planet Sentarion. The Rutans had intended to use the wormhole to allow their Queen to escape if the homeworld was ever directly attacked, but it could just as easily be used to send a Sontaran strike force directly after the Queen. Unwilling to allow the Sontaran/Rutan war to end and leave the winners free to turn on the rest of the universe, The Doctor managed to re-route the wormhole just as a Sontaran ship entered, turning it into an infinite loop that could never be escaped, the remaining Sontaran forces subsequently being overpowered by the Sentarii (Who had long worshipped the Rutans as gods). The Tenth Doctor had a particularly significant encounter with the Rutans when visiting the British Academy of Sporting Excellence, training elite athletes for the Globe Games, prompted to investigate reports of the recent strange deaths of some of the academy’s students ("The Sontaran Games"). Witnessing Sontarans in the corridors while examining the dead students - swiftly determining that the victims had been killed by electrocution -, The Doctor and his allies were trapped in the Academy when the Sontarans surrounded the building with a force field while also electrifying the TARDIS to prevent The Doctor escaping. While The Doctor was forced to compete against the humans in various sporting events in an outside arena, his new friend Emma was able to disable the force field that the Sontarans had erected to keep the javelins, hammers and discuses away from the humans, allowing the humans to kill their enemies. Although The Doctor deduced that ‘Emma’ was really a Rutan who had killed the real Emma to take her place and trigger a diplomatic incident at the Games, he gave her the option of travelling with him after he realised that she had shown concern for the other athletes at the Academy when she hadn’t needed to do so, but an attack by the injured General Stenx resulted in the two enemies destroying each other before The Doctor could learn what Emma’s answer would have been. The Eleventh Doctor found himself facing the Rutans and the Sontarans simultaneously when he arrived on Earth in 1605, shortly before the events of the infamous Gunpowder Plot of November 5th ("The Gunpowder Plot"), tracking a sub-temporal distress beacon being broadcast by a Rutan ship that the TARDIS had briefly collided with while leaving thirteenth-century Japan. With dimensional lesions being created around London due to the proximity of the TARDIS and the alien ship, The Doctor sent Amy and Rory to try to find the crashed ship while he worked on repairing the lesions, only for the Ponds to discover that they were underneath the Houses of Parliament as the Gunpowder Plot was being plotted, Rory noting the anomaly of female conspirator Lady Winters. Amy’s subsequent attempt to follow Lady Winters quickly revealed her identity as a Rutan, Amy only being saved when The Doctor’s attempt to close a lesion instead shifted it to open close to Amy and ‘Lady Winters’ as she reverted to her true shape, allowing The Doctor to travel through the lesion in time to disorientate the Rutan with the sonic screwdriver and force her to flee. While Amy searched for Lady Winters and The Doctor attended to the other dimensional lesions, Rory discovered a Sontaran battle squadron searching for the crashed Rutan ship, prompting him to find Amy to help him search for the ship. As The Doctor confronted Lady Winters, he confirmed that she was participating in the Plot to release her spaceship from its location underneath Parliament, just as Amy and Rory located the ship in question. Learning that the Rutan ship carried two genetic bombs that could each wipe the Sontaran race from existence - although they could also be reprogrammed for use against other races -, The Doctor was able to use the lesions to temporarily teleport Parliament into Earth’s atmosphere to escape the explosion while allowing the Rutans to take off, but then discovered that the bomb was still in Parliament, forcing him to return to Parliament and find both weapons. Having reprogrammed one bomb to be a dud, The Doctor gave one bomb to each side, noting that they could never use the bombs as they might be triggering the destruction of their own species. Even without encountering the Rutans directly, The Doctor has found himself facing the consequences of some of their plans against the Sontarans. On one occasion, the Fifth Doctor was forced to help the Sontarans against a Rutan creation known as the ‘Witch Guard’ which absorbed Sontarans into itself to grow, only being destroyed when a Sontaran marshal took his suicide pills before allowing the Witch Guard to consume him, killing both himself and the creature ("Heroes of Sontar"). On another occasion, the Tenth Doctor discovered that the Rutans had attempted to sabotage the Sontaran conquest of Earth ("The Sontaran Stratagem/The Poison Sky") by seeding plant spores around Saturn that would infect the Sontaran clones and turn them into hosts for young Rutans, only for the plan to fall apart when The Doctor defeated the Sontarans, leaving the spores on Saturn until Earth colonised some of the planet’s moons. Although the spores infected the human colonists during a local flower show, The Doctor was able to ‘starve’ the spores out of the humans after realising that they needed ammonia to exist when one died after the host was exposed to the TARDIS’s air-filtered atmosphere, inspiring The Doctor to program the colony’s own air-filtration system to remove the ammonia ("The Taking of Chelsea 426"). One trip to Victorian England even saw the Fourth Doctor and Sarah Jane Smith dealing with a plot to manipulate human genetics using a Rutan healing salve, recovered from a crashed Rutan ship, to merge genetic samples and create a superior ‘slave race’ that could do tasks humans couldn’t, such as laying underwater cables, The Doctor and Sarah thwarting the plot with the aid of Doctor Arthur Conan Doyle - the physician of a ship that had docked in the area and had been called in to examine the bodies of the creatures' victims - and a teenage Rudyard Kipling, The Doctor taking the merchildren created by the experiment to a new world where they could live their lives in peace after their creator had been defeated ("Evolution").